Every person on this planet knows what Coca-cola is and has tried it at least once. You can find it anywhere and in many places this drink is cheaper than plain water. The fact that the Coca-cola Company is connected to pollution and water shortage is little known because it creates an image of environmentally and socially conscious company. Moreover, Coke’s acidity makes people question its toxicity and its effect on human health. Coke’s pH rating is only one point higher than that of battery acid. Many studies have been conducted that show the negative effect Coke has on people. For example, a study included people who consume at least one soda per day and showed that they have 44% higher risk of developing metabolic syndrome. At the beginning of the study, these people showed no signs of metabolic syndrome. The examinees were tracked by the experts for at least 4 years. Moreover, another research showed that these people can experience a 48% increased risk of heart attack or stroke if consuming one or more sodas on a daily basis in comparison with those people consuming less or don’t drink sodas at all. In addition, soft drinks are proven to raise the risk of respiratory issues, such as asthma and COPD. Coca-cola’s acidity makes it a great cleaning agent. A pH of 0 to almost 7 in the scale is acidic, from 7 to 14 is alkaline, while the pH level of battery acid is 1 and pure water has pH of 7. Coke has pH levels as low as 2.5. 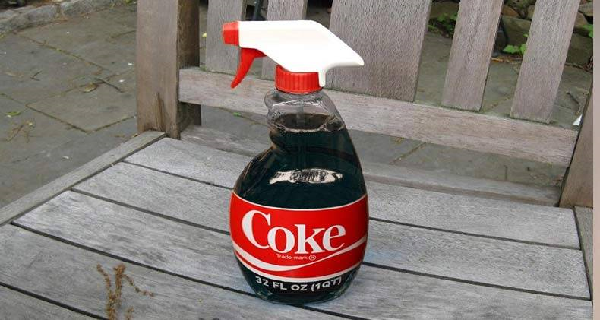 Coke can perform better in cleaning surfaces than many toxic household cleaners. Get rid of rust. You need fabric, a sponge, or an aluminum foil soaked in coke. Get rid of blood stains from your clothes and fabric. Remove oil stains from a garage floor. First let the stain soak and then wash off. Clean your burnt pans. Leave the pan soaks in the Coke and then wash off. Clean your engine with Coke. This is a technique Coke distributors have been using for decades. Shining pennies. Remove tarnish by soaking old pennies in Coke. Use Coke to remove stains from vitreous china. If you want to clean your toiler, pour Coke around bowl, let it sit for a while and then flush. Remove rust from chrome with coke and aluminum foil. It will make Chrome shiny. Remove paint from metal furniture. Dip a towel in Coke and lay it on the paint surface.